Teacher, mentor, leader; these are words to best describe Darrell Mahrle. Darrell was nominated by several of his co-workers and selected by a panel of past Stars of Life award winners at LifeCare Ambulance Service. A common theme heard in all of the nominations: Darrell is awesome with both students and new employees in his caring and thoughtful demeanor in guiding people that are developing their skills as EMS professionals. Darrell obtained both his EMT and Paramedic certifications from Kellogg Community College. 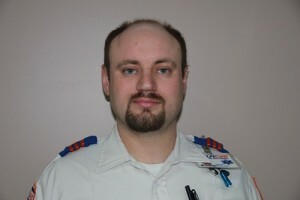 Hired in August of 2006, Darrell has progressed steadily from his beginning as a part time EMT to a career Paramedic. Prior to his EMS career, Darrell worked for his uncle at his veterinary clinic for three years.